Today used to be my wedding anniversary. What once was a significant date with happy memories attached is now just another number on the calendar. It was a gradual erosion. A long time ago, there were celebrations and gifts…then cards and flowers…then dinners and pleasantries. Now there is silence. As the day began, I realized it would have been 16 years. But it isn’t. It’s no longer a marker of anything special. 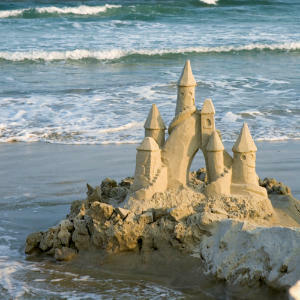 Like a sand castle, time was spent building, constructing a place… with towers and spires… and bridges. A little more here, a little smoothed-over there. With each addition, it grew to something recognizable. A moat was dug for protection from the encroaching sea. The sun shone on the glistening grains and it was good. Not Cinderella’s castle, but a fortress with flags flying nonetheless. Then the tide turned. At first, just small damage was done to the perimeter. Then wave after wave assaulted the structure. The intrusion ate at the foundation until the crumbling began. One wall at a time, it slipped away. Eventually, as always, the big breaker came. Crashing too close, it overwhelmed the turrets and the last defenses. When the water receded, the castle was gone. No one walking past would ever know what had been. I thought I would be sentimental about it all. But I’m not. It was created, it stood tall, it washed away. Maybe it’s because it was a slow decline. Maybe it’s because a part of me knew all along it was temporary… like all things. And now, surveying the landscape, I’m just a witness. I don’t regret the effort I put in. It was time well spent while the sun was warm. I don’t curse the forces of nature that swept it away. It’s inevitable. Things change. People change. What remains… or what has been re-created…is the beauty of a pristine beach as far as the eye can see.